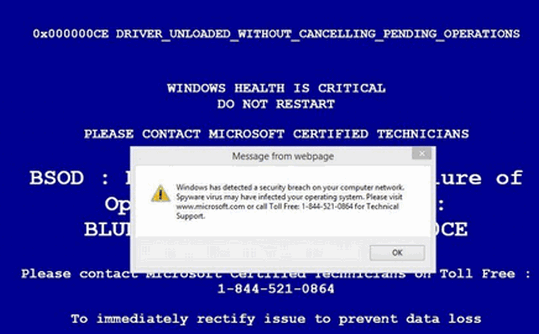 Tech Support Scams, Microsoft Support Scams: Scams Scams Everywhere! We published this article in May 2017 – focusing then on the Microsoft support scams going around at the time. This is a big update to that post and we’ve included even more screen shots of Microsoft tech support scams and other tech support scams – the ones you are most likely to encounter. But whether it’s a Microsoft support scam or any tech support scam, you need to know these kinds of scams abound- and sooner or later, you’re probably going to run in to one. We receive at lest 2 dozen emails each week from folks who encounter these kinds of scams and are convinced their security software has let them down… and woe… now they’re infected. But it’s not true. 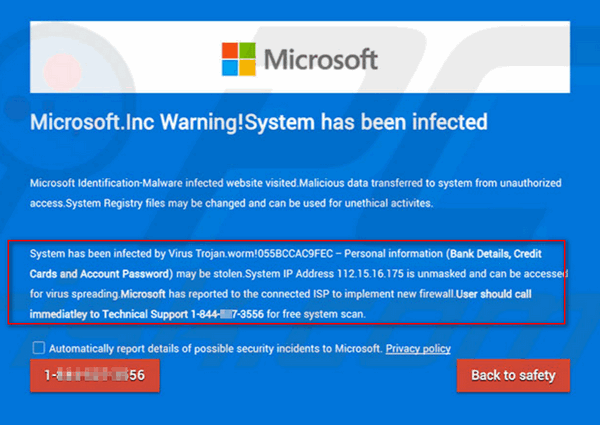 Most support scams are carefully crafted advertisements cunningly created to make them appear to be warnings coming from your own computer or from Microsoft. Because it seems these tech support scams are back in full vigor, we hope you’ll read this article, look that the images here, so that you’ll know, right away, when you’ve encountered one of these tech support scams. Remember: The actual warning you see may look a bit different [the most popular tech scam going around at the time of this writing what we call the “You-have-been-infected-with-the-Zeus-Virus” scam. 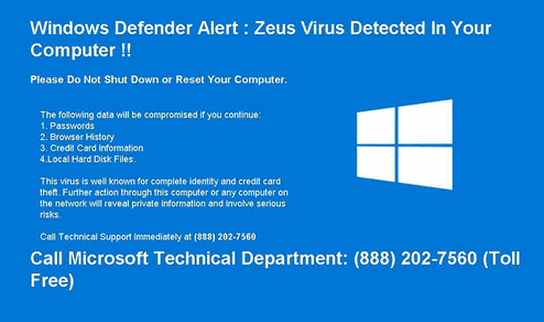 We can assure you, the so-called Zeus virus is really awful sounding, but it’s a fake. It’s the current “virus-du-jour” of the tech support scammer clique. In the past, most people who have run into the Tech Support or Microsoft Tech Support Scam have been contacted by scammers and warned by telephone that their computers are infected or compromised. But lately, it’s been the fake “your computer is infected with **you name the non existent virus/Trojan** or the **your computer has been compromised and your personal information is at risk** popup that appear, seemingly out of nowhere, when browsing the web. Just in the past week, we have had at least a dozen people who wrote to us and told us that they fell for or almost fell for a scam. 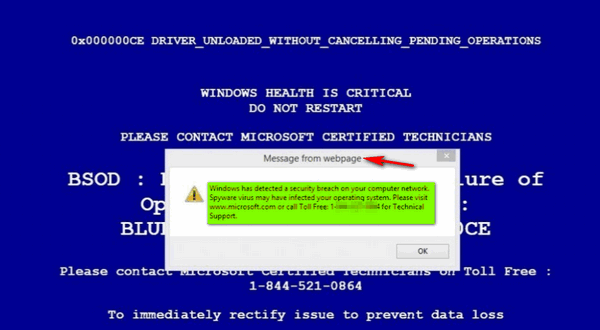 The one that seems to trick the most people is the one we’re going to call the Microsoft Tech Support Popup Scam. Most all of these fake “Your computer is infected” or “Your computer is compromised” or other dire warnings that pop up out of nowhere, are almost popups ads. They’re not viruses, or Trojans or malware. They’re ads that try to trick you into into calling a phone number for support. They’re scams. And regardless how many times the scam popups mention Microsoft or show the Microsoft logo, or how many times the ads refer to “Certified Microsoft Technicians” there’s a 100% certainty that they’re scams. We have warned our readers about scams many times, but we are once again seeing more and more people losing a great deal of money to these criminals… and many times they’re being tricked because they see the Microsoft logo or Certified Microsoft Technicians on the fake warning, and that convinces them the warning is legitimate and they let down their guard and call the phone number and then allow the crooks access to their PC. Microsoft is never going show you a popup warning you that your computer is infected or compromised. Microsoft is never going to show you a popup with a telephone number and urge you to call Microsoft Support to fix or clean your PC. Never. Not today. Not tomorrow. Not ever. No legitimate security software is ever going to tell you that your files are going to be deleted if you close a dialog or window… or tell you to call a phone number . Not even the worst legitimate security software would do that. Not today, not tomorrow, not ever. For this post, we’ve collected a few of these fake warning popups, and we posted them at the bottom of this article. Keep in mind, these are just a very few of the many variations of scam popups out there… there are hundreds of them. Some have different wording, slightly different colors, some look more realistic than others, but they all have the same mission: To get you to call a number so they “fix” the non-existent virus infections, computer problems or errors. People who do call will be told that the “technician” needs to connect to their PC so they can run special scans. The scans, of course, are fake and always turn up dozens, sometimes hundreds of infections, errors and problems. Not to worry, they’ll tell the victim… they all can be fixed… for a price. We have heard from people who have been bilked out of hundreds of dollars. One person who wrote us recently, lost $1000 on this kind of scam. There’s a newer version of the support scam or Microsoft Tech Support Popup Scam, where the victim calls a phone number and the technician runs the fake scan or scans, then tells them what’s wrong (all fake) then tells them they need to buy a couple hundred dollars worth software programs to clean, fix and protect their computer and their privacy. Of course, they’ll want your credit card number – would you actually give your credit card number to a criminal? No, of course not. But because people think they’re dealing with Microsoft, they do give out their credit card numbers and lose hundreds of dollars to scammers. Please do not fall for these kinds of scams. When you see one of these fake popup alerts or warnings, close all your browser windows. If you should see a warning that your hard drive will be wiped if you close your browser, it’s not true. I you can’t close your browser window(s) the usual way, open Task Manager by pressing the CTRL+SHIFT+ESC keys. In Task Manager, click on the “Processes” tab at the top. In the list of processes, right-click on each instance of your browser you see running and choose “end task”. Note: Google Chrome usually shows a process for every tab open and every Chrome extension running. You’ll need close as many of these as necessary until you see the browser window with the scam in it close. If you can’t still can’t get the windows closed, shut down your computer and restart it. As promised, here are some screen shots of scam popups. Remember: These are but a few of the hundreds of different scams out there – but most tech support scams use the same basic techniques to get you to all a phone number for help. All the references to Microsoft are just to lure you into to trusting the scammer. Microsoft has nothing to do with any of these scams. The image above looks authentic … very real. Its message is dire. But… this is just a scam, folks. Scam. Scam. Scam. All of the images below are scams too. Forewarned is forearmed. Commit these images to memory so if/when you encounter one one similar to these you’ll know exactly what to do. Above: Looks like your computer is a goner unless your call the [fake] Microsoft support number. Just another scam. Above: Whoa! It’s that big, bad Zeus virus again. No, it’s not. It’s just a another tech support scam. Above: Oh my! My data is going to be lost or corrupted if I don’t call that number! Woe is me. NO! Not woe is me. It’s just a tech support scam. Above: Another scam. This one is verbose. All kinds of dire warnings and not-so-veiled threats in this one. But it’s just a scam. It’s a scam I tells ya! Above: Note the dire warnings that your bank account and credit card details are at risk. In this case, they’re not lying. They are very at risk if you fall for this scam. As you can see they add your IP address and the date to make it look official. That’s easy to do. This scam has been making the rounds for years. Above… don’t let all the Microsoft logos and “Microsoft Certified Live Technicians” trick you. This is all a scam and it’s not coming from your computer. Notice at the top of warning it says “Message from webpage”. 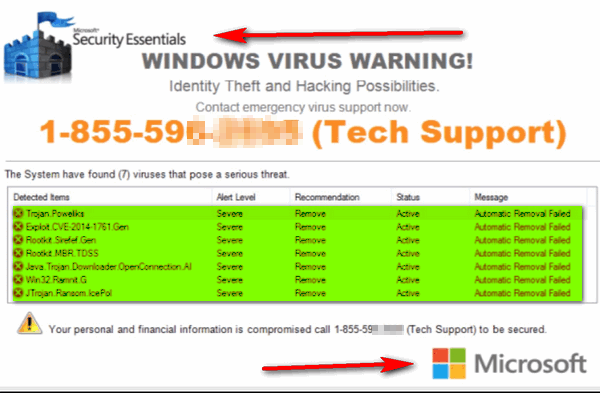 A dead giveaway that this scam did not come from your PC, but from the Web Plus, if you’re not using Microsoft Security Essentials… DUH! You should immediately recognize this as a scam. Above: The scam up close. Notice “Message from webpage”. That tells you that this popup did not come from your PC, but it’s just a popup ad from web page. Notice they don’t use “Microsoft technicians”, but “Microsoft Certified Live Technicians”. What else would they say, dead Microsoft technicians? They’re not technicians at all – they’re thieves, miscreants and criminals out to get your money. Another “Microsoft” alert. It’s not from Microsoft, it’s not from your PC. It’s just a web page popup ad. Again we have the “Microsoft Certified Live Technicians” back for an encore. When will they start using dead technicians? Live or dead, this is just another scam. Above: 4Are you getting the idea that there are an endless number of scams out there trying to trick you and steal your money? Don’t let them fool you. 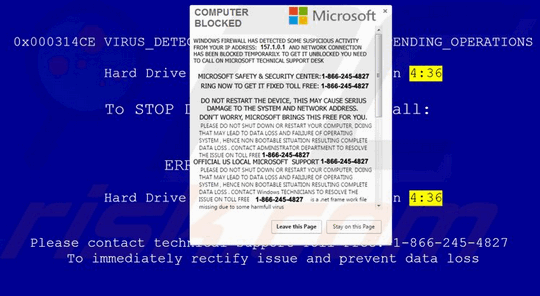 Above: A very real-looking scam pop-up, with the Microsoft logo at the top and Microsoft referenced in the body. Showing your IP address may scare some people, but your IP address is visible to every web site you visit. Want to see? Just go to http://thundercloud.net/start/useragent.htm . Your IP is part of the details your browser always shows automatically. Clicking the “Back to safety” button (above), leads you to another scam, and calling the number posted would lead you right tin o the nest of criminals that want to steal your money. It’s just another scam designed to trick you into giving up your money. Above: Another scam with a bit of drama. It’s going to delete your hard drive contents if you close this page. However, if you close the page, the only thing that will happen is you’ll be getting away from the den of thieves behind this scam. Notice that this one tells you to call “Microsoft Support Now!” and gives you a toll-free number. But, trust us, if you do call that number, you won’t be talking to Microsoft or even a technician, but you will be talking one on one with a real, live con artist. See the close up below. Woe is you! They’re going to delete your hard drive’s contents if you close this page. However, that will not happen. If you close this page, they criminals will just lose a potential victim. The one below is not as common these days, but it’s still making the rounds. This one’s warning tells you you’ve got a rootkit Trojan! With the scary name of ROOTKIT_TROJAN_HIJACK.EXE . Wow! They have all the key words that should send shivers down the spine of most users, but not you! By now, you know better, right? And notice the Microsoft references. This one has has been around a long time. The name of the Trojan changes, but not the scam… it’s the same old, same old. Just one more. Take a look at the image below. This scam makes it looks like you computer was scanned and lots of malware and bad stuff was found lurking on your PC. Looks like you better call and get it off or your PC will explode and your privacy will go up in a cloud of smoke (no pun intended). Notice the Microsoft logo at the bottom and the Microsoft Security Essentials logo at the top. 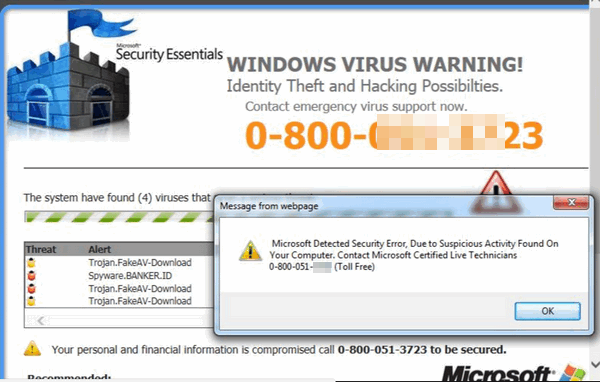 Now, if you’re not using Microsoft Security Essentials, why would you ever be fooled by this scam? And if you are using Microsoft Security Essentials, you should know better. Use something else. And you should recognize this as a scam, if for no other reason than the theatrical way they try to get you to call “Tech Support”. There are hundreds of these kinds of scams out there just waiting to trick you. They may all look slightly different, but they all have the same goal… to get you to scare you and make you believe that your computer is compromised or infected – and scare you into calling a number to get your PC fixed. These are scams no matter how many Microsoft logos you see or how many times they use “Microsoft Certified Technicians”. They are scams if they show you a phone number to call, Microsoft or not. They are scams when they tell you if you close the window you’ll lose all your data. 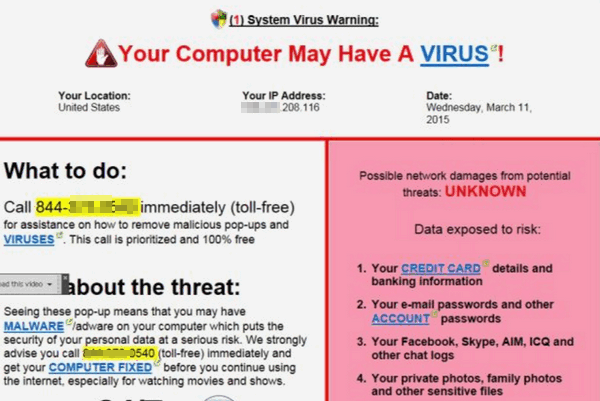 These criminals want you to call the number shown on the warning so they can run fake scans, that show you how badly your computer is infected, and tell you that even though your PC is very badly infected or compromised, don’t you worry – they can fix you right up for a price. DON’T CALL IN THE FIRST PLACE. DON’T PAY. Do not give your credit card or checking account information to them. If you fallen for a scam like these, call your credit or debit card company immediately and tell them you’ve been scammed. Don’t be embarrassed to admit it. Millions and millions of people are tricked by scams like these every year. Our mission is to help keep you safe. We hope this helps article will help you to recognize a scams if and when you ever seen one. Thanks for this info folks. You did not recommend that they would be well protected if they had purchased and installed a reliable Anti-Malware Program. (thanks for not taking the opportunity to recommend a program that you personally endorse. Kudos to you folks). I’m protected thanks to you. Hi Arnie… Thank you! Users cannot install any software that will prevent them from falling for a scam. The only software that can prevent a person from being scammed is the software between the ears and common sense that will keep them from being a victim of a scam. Because I use Emsisoft, I know all of these scams would not have any effect on my computer. My Emsisoft program has not failed me since I started using it 3 years ago. It does everything in the background and I never have to worry. Yes, I still have to use the good old common sense and not click on things that I know I should not be clicking on. That is always the first rule of safety. Yes, I always read your newsletter and watch for things like this. Thank you for keeping us so well informed. Hi Jason. Thanks! We love Emsisoft and we trust it completely. Our families and friends use it – we use it and we recommend it. But this is for everyone to read… Emsisoft is security software – it does a super job protecting users from from viruses, malware, ransomware, PUPs and more, but it cannot prevent someone from falling for a scam. It can’t prevent someone from picking up a phone and calling one of these fake tech support scam phone numbers. It cannot stop someone from being duped into giving away their credit card number to a scammer. 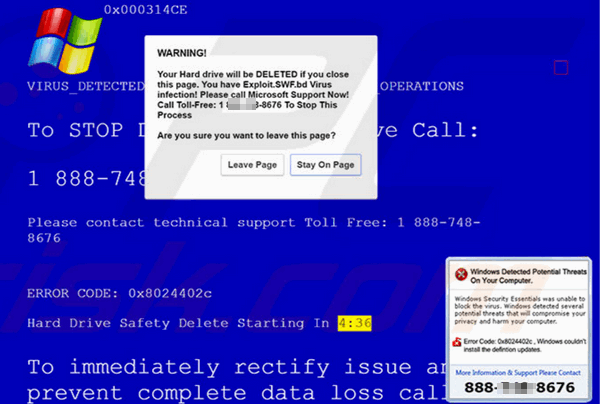 Most tech support scams are shown to users as legitimate advertisements. We just want to caution folks that nothing they can install on their PC can prevent them from falling for a scam. The best software for this, as you point out, is the software between your ears… your brain, your common sense, and your knowledge. Thanks again, Jason. Related to this…when I get a phone call from “Microsoft Security” I simply tell them “I have an Apple” or “I have a Mac” and they hang right up! Works every time! Why would you get a phone call from MS in the first place? Just curious. You would not. That’s the point. Microsoft isn’t going to call you. But that does not meet 10,000 scammers running support scams are not going to call you claiming they are calling from Microsoft. Last year Microsoft tech support scams, were criminals claiming to be Microsoft tech support personnel, bilked users out of tens of millions of dollars. Microsoft isn’t going to call you – that’s the point. But that does not mean no one is going to call you claiming to be Microsoft. I have Emisisoft Anti-Malware on my computer & recently a voice came on & told me my computer is infected with a virus. It created a page saying if I click off the page my credit cards & banking info would be compromised. This was really unnerving, I wondered how this was happening since I have Emisisoft? Carol, take a few minutes and re-read the article. It addresses exactly what you say you encountered. It’s important that you go back and re-read it and look at the screen shots we included. Emsisoft is a security program – a great antivirus, antimalware, anti ransomware, and protects you from PUPs, hijackers and more, but it can’t prevent you from not recognizing a trick advertisement trying to goad you into calling a number or clicking a link. Only your common sense can do that. No software is ever going to keep people from getting tricked into doing something they shouldn’t. This kind of trickery has been going on for decades, long before the Internet was popular. Scams have been around almost as long as money. You can’t expect any security software to protect you from an advertisement that tries to trick you into believing something has infected your computer and the only way to get rid of it is to call a toll-free support number or click a link. If you do either of those things without thinking, you are going to get scammed. And the article you’re commenting on is trying to help you recognize these scams before you worry and lose money. I’m placing all my nickels on you , Darcy and TC. That is where the “best in the world” is in regard to trust and honesty! Again and again, thank you , thank you , thank you! Yesterday we got hit with one of these and it was bad. To make a long story short, I lost everything that was not backed up and that was about 3 months worth, I am heart broken!! My husband did click on the fake Microsoft but did not give out information as to credit cards etc. But by the time he finally listened to me about all this being wrong it was too late, they had corrupted all my files for real! He called them a few bad names and hung up! Yes we have Emsisoft and they did alert me to the virus and I took care of that BUT somehow it piggybacked unto something else and ruined everything. We each feel we did something wrong somehow to have had this happen? It was just like a house of cards take the wrong card off and the whole thing collapses. Live and learn and ALWAYS head warnings better.